3 minutes and 10 seconds. 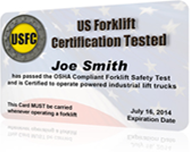 You must have a current Forklift Operation Certification to operate a forklift while on the job. We take you step by step through our easy-to-follow training, which you can complete in a mere 1 to 2 hours right on your computer. Upon competition of this course, you will be 100% compliant with laws. Don't sit in a classroom to get your credentials. If you have a computer with an Internet connection, you can take our course anywhere - including your smart phone. That means you don't have to go any further than your living room - or even the palm of your hand - to get the training you are required to have. GOT A PRINTER? 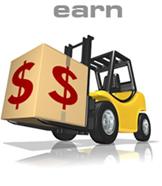 Print your Nationally Recognized Forklift Certificate immediately upon course completion. You can also print the PowerPoint presentation, Safety Regulations and Rules Report, Field Test and Checklist, and the Answers you need to successfully complete your course. On the job, your employer should administer a driving test in order to complete the OSHA requirements for safe operation. Your license is good for a FULL 3 YEARS from the date of your driving test. You won't be required to retest until the 3-year window is up. View the entire course, including materials, risk free. If you find that it's not exactly what you need, we'll cheerfully refund your money*, and you keep the materials. I DARE YOU - try to find a competitor's online course that makes it totally risk free for you to get certified. *You must submit your request within 30 days of registering and before attempting the final exam. We'll mail you your personalized Nationally Recognized USFC card, which is good for a full 3 years. And don't forget you can immediately print your own Nationally Recognized Certificate with your name and date of test completion to use as proof until your handy USFC card arrives. We'll email you a digital copy of your certificate, which can also be sent to your employer upon request. You'll also receive your USFC hardhat sticker that you can proudly wear. Your order is processed immediately, and you'll get a receipt for your purchase with a transaction number and a link to where you can view the entire course and test right away. When you click on the button below, you'll be taken to a secure order page for your credit card information. We use third party secure processing companies so your order information is kept completely confidential - only the processing company and your credit card company can access the information. The whole process takes just a few minutes and you'll be viewing the course and test in less than 10 minutes from right now. What are you waiting for? Start earning the kind of money you deserve. P.S. A wise man once said everything that we have in life is a direct result of the choices that we make and don't make. I think the choices that we don't make are the ones that really matter. I don't think you ever hear anybody sitting in a nursing home at 80 years old talking about the mistakes of the things that they did do in their life. It’s always the regrets of the things that they didn't do that sadden them and depress them in their old age. Are you ready? Are you going to regret that you didn't take action? That you didn't do something? That you didn't take a chance? That you didn't roll the dice? Come on. Make something happen for once in your life. Be proactive. Be positive and take action. Grow a spine. Be a man. Do the right thing. Come on. Let's get started. Am I pushing you? You bet. I'm going to push you because I know this forty bucks doesn't matter to you one way or the other. You'll spend that kind of money on a dinner out. Forty bucks doesn't matter to anybody. What DOES matter is that you go out and take action. That you do things right in your life. That you make life interesting and exciting again. P.P.S. One of my favorite people in the world, Lee Iacocca, said the number one thing that he looks for in a successful person is the ability to make a decision. Most people sit on the fence. You know what? The fence pay is terrible. Nobody ever gets anywhere sitting on the fence, but I'll bet that’s where you're firmly planted right now, isn't it? Which way are you going to go? Are you just going to sit there? Are you going to tip back into mediocrity? Go back into work tomorrow and decide that you're going to dedicate yourself and do an even better job at what you do, whether they decide to fire you later or not?